Objective: To investigate the expression of NDRG1 gene in marrow mononuclear cells of children with Acute Leukemia (AL) and its clinical significance. Methods: The expression level of NDRG1 mRNA at different stages was detected by RT-PCR in a total of 60 children with AL with another 20 children with Idiopathic Thrombocytopenic Purpura (ITP) enrolled as control group. Results: The positive expression rate of NDRG1 in 60 children with AL was 66.7% (40/60), in which it was highest in children with AML (88.2%) (AML group), significantly higher than that in children with ALL (38.5%) (ALL group) and in control group (10%) (P<0.05) with no statistically significant difference found between the latter two (P>0.05). The expression of NDRG1 mRNA in AML group was significantly higher than that in ALL group and control group. NDRG1 had varying expression in AML children of different types and the relative expression level of mRNA was successively M5>M4>M1 and/or M2, but no expression was found in type M3. NDRG1 had moderately high positive expression in high-risk children with AML. In AML patients the positive expression rate of NDRG1 mRNA level of the children with diagnosed disease but given no treatment (initial group) were significantly higher than in those with remission (remission group) and control group, with no statistically significant difference found between the latter two; the expression of NDRG1 in children with no remission (non-remission group) was significantly higher than that in remission group and control group. Conclusion: The high expression of NDRG1 is related to occurrence of AL and children with AML have obviously higher expression level of NDRG1 than children with ALL. It is associated with the risk of leukemia and suggests poor prognosis. Therefore, NDRG1 gene may be a target for AL diagnosis, treatment and prognosis in children. NDRG1, Children, Acute leukemia, Marrow mononuclear cells. Acute leukemia is caused by uncontrolled proliferation of immature lymphoid or myeloid progenitor cells presenting clonal proliferation and blocked at a specific differentiation stage . Its incidence rate ranks the first in childhood cancer, reaching 3/10 million, in China there are about 10 thousand more children with leukemia each year in which Acute Lymphoblastic Leukemia (ALL) accounts for 80% and Acute Myeloid Leukemia (AML) 20% . The cancer-associated mutations of cell differentiation, cell cycle, tumor suppression, or apoptosis are related to the development of leukemia with effects on the sensitivity to drugs . In recent years, it has been mainly given standardized treatment based on risk classification standard in clinical trials, the prognosis of children with acute leukemia has been significantly increased, especially in patients with Acute Lymphoblastic Leukemia (ALL), the 5 y disease free survival rate is up to 80%-90%, and in patients with Acute Myeloid Leukemia (AML), it amounts to about 50% . With the development of genetics technology, many new leukemia-associated genetic alterations have been discovered through analysis of gene expression profiling, Single Nucleotide Polymorphism (SNP), Copy Number Variation (CAN) of DNA, epigenetic changes and whole genome sequencing, which provides new insights into the pathogenesis of leukemia and reveals the cause of difference in treatment response among individuals . Genetic changes have made the risk classification of childhood leukemia increasingly accurate and provide potential molecular targets for targeted therapies. As tyrosine kinase inhibitors succeeds to treat BCRABL1 positive chronic myelocytic leukemia and CD20 monoclonal antibody manages to treat lymphadenoma, the role of targeted drug therapy has become more and more important . Human NDRG1 (N-myc Downstream Related Gene 1) is a gene newly discovered in recent years and its relationship with tumor attracts more and more attention. Initial studies have shown that  NDRG1 is lowly expressed in colon cancer as well as prostate cancer and highly expressed in colon cancer cell lines with in vitro induced differentiation, so it is considered as a tumor suppressor gene that is perhaps positively associated with degree of cell differentiation. However, it has been recently reported that  NDRG1 protein has low expression in normal tissues and high expression in various cancers like brain tumors, breast cancer, lung cancer, kidney cancer as well as melanoma, so it is thought to be a new tumor marker which could detect cancers. At present, reports on the relationship between NDRG1 expression and childhood acute leukemia are rare. In this study Reverse Transcriptase Polymerase Chain Reaction (RT-PCR) was used to detect the expression of NDRG1 in marrow mononuclear cells of children with ALL so as to explore the correlation between NDRG1 expression laws and ALL treatment as well as prognosis, expecting to provide new theoretical references for target therapy of childhood leukemia and prognosis improvement. A total of 60 children diagnosed with AL in our hospital from February 2015 to May 2017 were selected to collect 60 bone marrow specimens, among whom there were 39 boys and 21 girls, aged from 9 months to 12 years plus 5 months with a mean age of 6 years plus 7 months. According to MICM (morphology, immunology, cytogenetics and molecular biology) classification of leukemia, the specimens were divided into acute myeloid leukemia (AML) including 34 cases (M1 in 6 cases, M2 in 7 cases, M3 in 5 cases, M4 in 8 cases, M5 in 8 cases) and Acute Lymphoblastic Leukemia (ALL) including 26 cases. Another 20 children with Idiopathic Thrombocytopenic Purpura (ITP) were enrolled as the control group, including 12 boys and 8 girls aged 10 months to 12 y and 4 months with a mean age of 6 y and 3 months. The collection of samples was approved by children’s parents. According to period of sample collection and judging criteria for early AL treatment, they were divided as initial group, remission group and non-remission group as shown in Table 1. The initial group referred to the children who were diagnosed with AL but given no treatment. The remission group included the children who had the remission of disease after 1 course of conventional combination chemotherapy and the nonremission group consisted of the children whose had no remission of disease after 1 course of conventional combination chemotherapy. There were 43 cases in the initial group (43 bone marrow samples). AML was treated with chemotherapy by DAE (daunorubicin, Ara c and etoposide) program in which the type M3 was treated by All-Trans Retinoic Acid (ATRA) combined with Daunorubicin (DNR). ALL was treated by chemotherapy regime of VDLD (Vincristine, Daunorubicin, L-asparaginase and Dexamethasone). A total of 14 bone marrow specimens were collected from 14 children in the remission group and 3 specimens collected from the 3 children in the non-remission group. Table 1: MICM classification diagnosis and grouping of 60 bone marrow specimens. Human lymphocyte separation (Beijing LEYBOLD Cable Technology Co. Ltd.); human leukemic U937 cells (Shanghai Academy of Sciences China cell bank); RPMI-1640, fetal bovine serum (Shanghai Joe Yu Biotechnology Co. Ltd.); RNA Extraction Kit (Shanghai Adams letter Biotechnology Co. Ltd.); RT-PCR kit and NDRG1, β-actin primer (Shanghai Kang Lang Biotechnology Co., Ltd.). U937 cells were cultured at 37°C, 5% CO2 in the incubator with saturated humidity by using fetal bovine serum and RPMI-1640 media with 10% in the final concentration of 100 thousand U/L penicillin and streptomycin. The cells were in suspension with good growth state. The medium was changed every 2-3 d with one time of subculture, the cells in logarithmic growth phase were selected with the count of 1 × 106 and the total RNA was extracted for RT-PCR as the positive control for the tested samples. A volume of 2 ml bone marrow samples were taken by conventional bone marrow puncture followed by being injected to 20 ml test tube containing EDTA anticoagulant, and marrow mononuclear cells were isolated in each sample with human lymphocyte separation solution. At room temperature, 2 ml of saline was added to dilute samples and the centrifuge tube was added with 2 ml human lymphocyte separation liquid followed by an inclination toward 45º, diluted marrow liquid was slowly added along the tube wall with clear interface, layering could be seen after centrifugation at 2000 r/min for 30 min by horizontal centrifuge, the middle layer of white pellicle was extracted by aseptic inhalation to mix with saline 5 times in the volume followed by centrifugation at 1000 r/min for 10 min and continuously washing cells twice. Finally, the sample was routinely frozen for reservation. Total cellular RNA was extracted according to the instructions of kit and RNA was purified with centrifugal adsorption column followed by being soluble in RNase Free, A260/A280 ratio of the absorbance in samples was determined by ultraviolet spectrophotometer, ranging from 1.8 to 2.2, and the concentration of total RNA in samples was measured. Operations were conducted in accordance with instructions of RT-PCR kit. The synthesis conditions of single chain cDNA were: 37°C, 15 min; 85°C, 5 s, 1 cycle. The sequence of NDRG1 primer was designed and synthesized by the Primer Premier software as follow: upstream 5'- GATCACUCUCCGATGUGCCUT-3', downstream 5'- UGCUTUCUGCCGUATGCAGTG-3'; internal control β-actin sense sequence 5'-CTCCATCCTGGCCTCGCTGT-3', antisense sequence 5'-GCTGTCACCTTCACCGTTCC-3'. The reaction conditions were as follows: pre-denaturation at 95°C for 5 min; denaturation at 95°C for 30 s, annealing at 55°C for 30 s and 72°C extending for 60 s, a total of 30 cycles, and finally 72°C extending again for 10 min. PCR products were obtained by electrophoresis on 1.5% agarose gels containing nucleic acid dyes for 40 min under 100 V. Gel-proanalyzer software was used to analyse the image and calculate the relative mRNA expression of target gene. The relative expression of NDRG1 mRNA=NDRG1 gray value/β- actin gray value × 100%. SPSS 21 statistical software was used for processing data in which the measurement data were described as mean ± standard deviation. The sampling rate was assessed by χ2 test and single factor analysis of variance was used to compare among groups, P<0.05 suggests that the difference is statistically significant. The positive expression rate of NDRG1 in 60 children with AL was 66.7% (40/60), in which it was highest in AML group (88.2%) significantly higher than that in ALL group (38.5%) and in control group (10%) with no statistically significant difference found between the latter two. The expression of NDRG1 mRNA in AML group was significantly higher than that in ALL group and control group. No statistically significant difference found between the latter two (Table 2 and Figure 1). Table 2: Expression of NDRG1 mRNA in bone marrow of each group. Figure 1: Determination of NDRG1 expression in each group by RTPCR. M: Marker; 1 and 2: control group; 3: U937 cell; 4-8: AML group, respectively as M5, M4, M3, M2 and M1; 9 and 10: ALL group. Children with AML were divided into various subtypes according to the FAB classification. The distribution patterns of NDRG1 mRNA level were studied among AML subtypes and it was found that NDRG1 had varying expression in AML children of different types, in which the NDRG1 mRNA expression of type M5 was the highest followed by type M4 but with no expression detected in type M3, the expression levels of NDRG1 mRNA in type M1 and M2 were low (Table 3 and Figure 1). Table 3: Expression level of NDRG1 mRNA in various AML subtypes. There was statistically significant difference in positive rate of NDRG1 between the initial group and the control group as well as the remission group, but with no significant difference between the latter two (Table 4). The chemotherapy effect was varying in groups due to the difference of NDRG1 expression, the expression level of NDRG1 mRNA of the initial group was relatively high and its average expression level was decreased after the remission by chemotherapy, while in the nonremission group, the expression level of NDRG1 mRNA was still as high as 0.645 ± 0.037. The relative expression level of NDRG1 in the initial group was higher than that in the control group and that in the remission group and wasn’t significantly different from that in the non-remission group of no statistical value. The expression level of the non-remission group was higher than that of the control group and that of the remission group. No significant difference between the latter two (Table 4 and Figure 2). Table 4: Relationship between positive expression of NDRG1 and chemotherapy efficacy in children with AML. 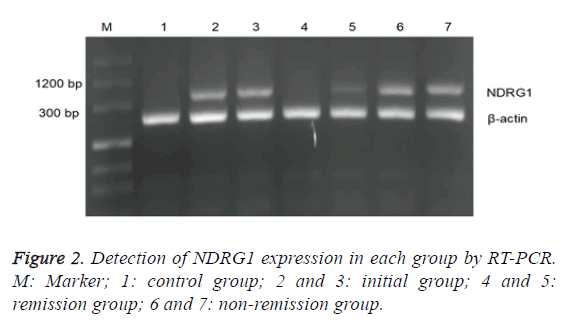 Figure 2: Detection of NDRG1 expression in each group by RT-PCR. M: Marker; 1: control group; 2 and 3: initial group; 4 and 5: remission group; 6 and 7: non-remission group. According to instructions in diagnosis and treatment of children with AML, (low-risk group: M3, M2b and inv16 chromosomal change; high-risk group: with any one of risk factors related to prognosis, middle risk group: high-risk with no related risk factors), AML was divided into low risk group including 13 bone marrow samples, middle risk group including 12 samples and high-risk group including 9 samples. The results showed that the positive expression rates of NDRG1 in high risk group, middle risk group and low risk group were respectively 100%, 91.7% and 84.6%, the corresponding relative expression level of NDRG1 mRNA was respectively 0.61±0.01, 0.46 ± 0.08 and 0.31 ± 0.06, the relative expression of NDRG1 mRNA in high risk group was higher than that in low risk group and that in high risk group (Table 5). Table 5: Relationship between positive rate of NDRG1 and risk classification in AML children. Malignant tumor is a systemic, proliferative and clonal disease. It requires comprehensive treatment such as surgery, chemotherapy, radiotherapy, biotherapy and immunotherapy in which chemotherapy plays an irreplaceable role in radical treatment of malignant tumors, especially in the case of leukemia. The biggest obstacle for successful treatment is the resistance of induced tumor cell to chemotherapeutic drugs. Therefore, the study on tumor multidrug resistance has currently become the focus in life science filed. Multidrug resistance is a procedure controlled by multiple genetic factors, such as classic multidrug resistance gene (MDR1) and breast cancer resistant-associated protein gene (BCRP) and antiapoptosis gene Survivin, which is related to multidrug resistance of acute leukemia, but these genes fail to completely elucidate the mechanism of multidrug resistance formation in tumor cells [9-11]. In AL the incidence of AML accounts for 1/4 and its mortality rate exceeds 1/2. With the progress of research, more and more indexes can be used to predict AML treatment effect and prognosis . At present, to study the characteristics of gene changes in AML patients has become a hot topic. Human NDRG gene family has been found in recent years, which has such four members as NDRG1, NDRG2, NDRG3 and NDRG4 with 57%-65% of homology within and when NDRG was initially found, its expression was significantly increased in mouse embryos with N-myc gene mutation . NDRG1 is mainly distributed in kidney, brain, heart, skeletal muscle, placenta as well as lung and the result of immunohistochemistry reveals that it is mainly distributed in the epithelial tissues such as digestive tract epithelium and urinary tract epithelium with its protein located in the cytoplasm . At present, there are few reports about the correlation between NDRG1 and development of leukemia. In this study, the expression of NDRG1 was detected in each group by its positive rate and mRMA level and the results showed that NDRG1 had high expression in children with AL at the total expression rate of 66.7%, in which the positive rate and expression level of NDRG1 in AML group were significantly higher than those in ALL group and those in control group, but with no significant difference between the latter two, suggesting that the overexpression of NDRG1 is closely related to the incidence of childhood AL with significantly higher level in AML than in ALL. The further study on the distribution of NDRG1 mRNA expression among various subtypes of AML showed that NDRG1 had varying expression in AML children of different types and the relative expression level of mRNA was successively M5>M4>M1 and/or M2, but no expression was found in type M3. The differences among type M5, M4, M1 and (or) M2 were statistically significant, but the difference between M1 and M2 in NDRG1 mRNA expression level was not statistically significant. According to the study, NDRG1 has high expression in children with AML except for type M3 and it remains to be further studied that whether the difference is related to limited number of samples and distribution or varying development of hematopoietic system between children and adult. In addition, there is a certain relationship between NDRG1 expression and the risk of childhood AML, the higher the risk of AML, the higher the expression of NDRG1, suggesting that NDRG1 expression level can be used as a reference for AML risk evaluation. At present, chemotherapy remains the main treatment for AML and multidrug resistance of leukemia cells to drugs is the main reason leading to the failure of treatment. One of mechanisms for drug resistance is that the anti-apoptotic ability of leukemic cells increases with decreased sensitivity to drugs to reduce chemotherapy effect and affect prognosis . At the early stage the research group studied the resistance of NDRG1 with siRNA interference in U937 (human acute monocytic leukemia cell line) and the result suggests that silencing NDRG1 gene can reverse the resistance of tumor cells to chemotherapeutic drugs and improve the drug sensitivity to promote apoptosis. The study found that in children with leukemia cells, there is difference in the positive expression rate of NDRG1 between before and after chemotherapy and that its positive rate in initial group, remission group and non-remission group was respectively 95.8%, 62.5% and 100%; semi quantitative analysis showed that the relative expression level of NDRG1 mRNA was seen in non-remission group, initial group and remission group by descending order, indicating that in children with AL, both the positive rate and the relative expression level of NDRG1 mRNA in initial group and in nonremission group were significantly higher than those in remission group and in control group yet with no significant difference found between the latter two groups, which suggests that AML children with high expression of NDRG1 have poor prognosis. It is perhaps because the high expression level of NDRG1 in initial group and non-remission group can inhibit the apoptosis of leukemic cells and increase the cell resistance, but the mechanism of action needs to be further studied. Agaian S, Madhukar M, Chronopoulos AT. Automated screening system for acute myelogenous leukemia detection in blood microscopic images. IEEE Sys J 2017; 8: 995-1004. Cheng H, Huang CM, Wang Y. Microarray profiling and co-expression network analysis of the lncRNAs and mRNAs associated with acute leukemia in adults. Mol Biosys 2017; 13: 1102-1108. Pine AB, Lee E, Sekeres M. Wide variations in blood product transfusion practices among providers who care for patients with acute leukemia in the United States. Transfusion 2017; 57: 289-295. Reismuller B, Peters C, Dworzak MN. Outcome of children and adolescents with a second or third relapse of Acute Lymphoblastic Leukemia (ALL): a population-based analysis of the Austrian ALL-BFM (Berlin-Frankfurt-Munster) study group. J Pediatr Hematol/Oncol 2013; 35: 200. Dingwoke JEF. Developmetn and evaluation of matrix type-transdermal patches of pioglitazone hydrochloride. Univ J Pharm Res 2016; 1: 31-37. Ou J, Vergilio JA, Bagg A. Molecular diagnosis and monitoring in the clinical management of patients with chronic myelogenous leukemia treated with tyrosine kinase inhibitors. Am J Hematol 2008; 83: 296-302. Kimfuchs C, Winterhalder S, Winter A. The silencing of N-myc downstream-regulated gene-1 in an orthotopic pancreatic cancer model leads to more aggressive tumor growth and metastases. Digest Surg 2014; 31: 135-142. Strzelczyk B, Szulc A, Rzepko R. Identification of high-risk stage II colorectal tumors by combined analysis of the NDRG1 gene expression and the depth of tumor invasion. Ann Surg Oncol 2009; 16: 1287-1294. Burger H, Foekens JA, Look MP. RNA expression of breast cancer resistance protein, lung resistance-related protein, multidrug resistance-associated proteins 1 and 2, and multidrug resistance gene 1 in breast cancer: correlation with chemotherapeutic response. Clinic Off J Am Assoc Cancer Res 2003; 9: 827-836. Nakanishi T, Karp JE, Tan M. Quantitative analysis of breast cancer resistance protein and cellular resistance to flavopiridol in acute leukemia patients. Clinic Cancer Res Off J Am Assoc Cancer Res 2003; 9: 3320-3328. Jin F, Zhao L, Guo YJ. Influence of etoposide on anti-apoptotic and multidrug resistance-associated protein genes in CD133 positive U251 glioblastoma stem-like cells. Brain Res 2010; 1336: 103-111. Bhalla S, Tremblay D, Mascarenhas J. Discontinuing tyrosine kinase inhibitor therapy in chronic myelogenous leukemia: current understanding and future directions. Clinic Lymph Myel Leuk 2016; 16: 488-494. Shi XH, Larkin JC, Chen B. The expression and localization of N-myc downstream-regulated gene 1 in human trophoblasts. Plos One 2013; 8: 75473. Wei W, Bracher-Manecke JC, Zhao X. Oncogenic but non-essential role of N-myc downstream regulated gene 1 in the progression of esophageal squamous cell carcinoma. Cancer Biol Ther 2013; 14: 164-174. Gamez AM, Martanez C, Gonza M. Chemokines and relapses in childhood acute lymphoblastic leukemia: A role in migration and in resistance to antileukemic drugs. Blood Cell Mol Dis 2015; 55: 220-227.